I’m so excited to share these 2 amazing Natural History Prints with you guys! Both of these gorgeous Bird’s Eggs prints (1 with nests) came straight from Europe, Germany to be exact, and I think these are just so very special. This is the sort of thing that makes my heart go pitter patter. I hope you feel the same way, if they have the same effect on you then we are kindred spirits for sure! 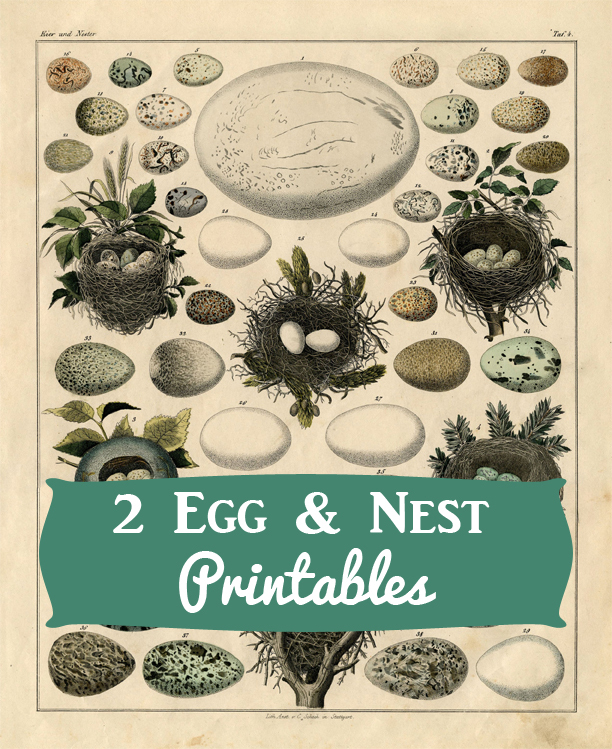 I’m always on the hunt for amazing Natural History Prints, and Egg Prints and Nest Prints are among my favorite themes, when hunting down those paper treasures. I think this is probably the best Eggs and Nests print that I have ever had and it will be hard to top this one in the future! Totally swoon worthy and so worth splurging on!! 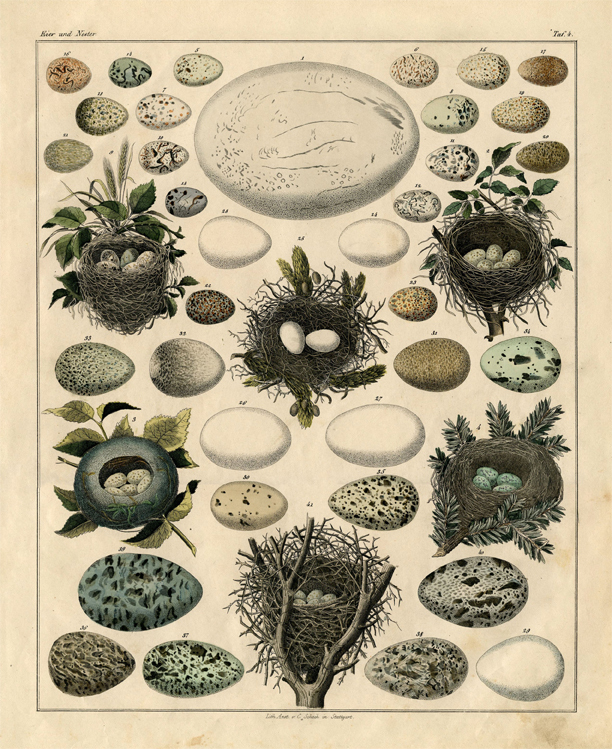 This amazing German print dates to 1843 and shows a variety of different types of Nests and Eggs, in soft muted colors. So beautiful!! I’m planning on extracting and enlarging some of the Nests on their own for you guys in the near future, but for now I hope you will enjoy the print as a whole. I did some moderate cleaning up, but left some of the age marks, so that it will still look old when you print it out. 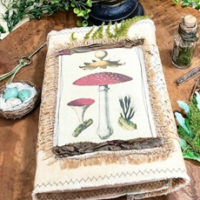 Great for framing as it is, or wonderful for your Handmade Collage or DIY Home Decor Projects! This is the second gorgeous Natural History Print… also Circa 1843, that I received in the same package! 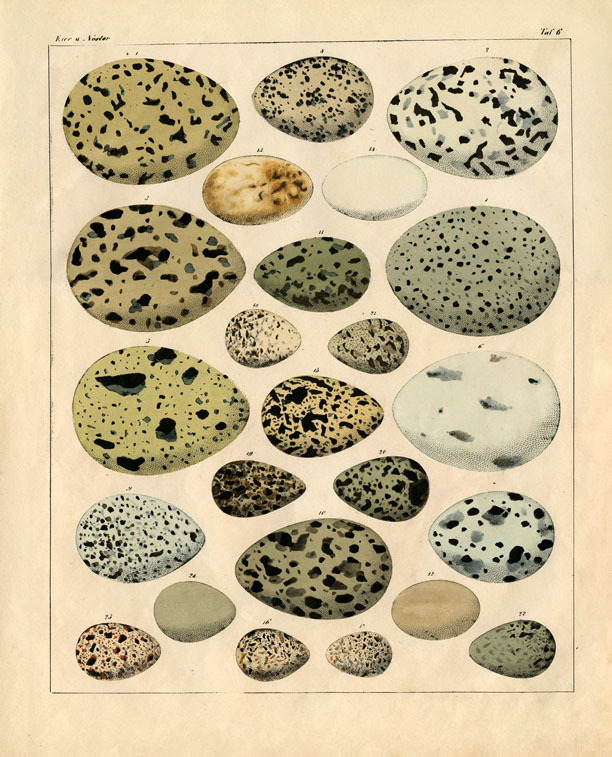 This one shows all Bird’s Eggs (no Nests) of various shapes and sizes, some are spotted, and some are not. There are 24 different Eggs in total. I think the two of these Printables would look fabulous framed and hung together on a wall! The colors include soft greens, pale blues, tans and browns, with a natural aged parchment colored background. You could print these both out and frame them up for some Instant Printable Art for your home, or use them in your displays … one of my favorite ways to display these old prints is under a glass cloche, you could add a little natural Bird’s nest to the vignette, and maybe a few faux eggs, and perhaps a feather or two, to create a very sweet display for your home decor. Let me know what creative ideas you have for these in the comments. You might also like a collection of beautiful Bird Images and Printables from HERE. Welcome, I’m so glad you’re here! Browse around to find thousands of Stock Images that you can use in your projects or designs! I post new Vintage images every day, as well as projects and DIYs too! Need more info about my site? Try my FAQ page for the answers to frequently asked questions. This is wonderful, Karen, and thank you! Thanks you guys!! I have a coordinating print that is all Eggs that I will share with you next week. They would look great framed and hung together! Beautiful! Excited to see the eggs! I agree, it is lovely! Thank you for sharing. I absolutely adore this!! Thank you so much for posting, it’s stunning! Absolutely GOR GEE US! Thanks so much for sharing! Ohhhhhhh eggs and nests, a guilty pleasure! Can’t wait for the next gift of eggy-ness! It’s so lovely – I’ve saved it already. Thanks so much for sharing ! you are too kind, thank you so much for sharing!! I love it! Yes mam, this is a good one here!! No kidding! Wonderful! Thank you sooooo much! Love it! I took a class the other day and the lady used some of your bird and egg images and I want to do another one. I look forward to seeing your images every day. Thanks so much. Karen, that’s lovely! Very worth it, I’m sure. I can imagine how nice it is in person! Super!!! Thank you for splurging. This is GORGEOUS!!! Thank you so much for sharing, Karen! gorgeous and totally nostalgic. 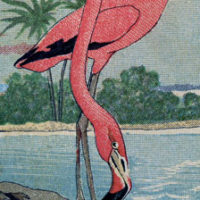 i love the old natural history prints from the 1800’s. thank you for sharing. LOVE this – you can never have too many bird’s nests! Thanks Karen! Oh my goodness, this is gorgeous! Thank you so much. I am going to frame it now. You are so good to us. I truly appreciate you. Thank you Karen!! This is a beautiful print. WOW! It is beautiful images, I have that antique look. This is really wonderful! I would love to see the names of the kinds of eggs and nests. . . is that what the numbers are for? Do you have access to it? I absolutely love this site! Very nice…Thanks so very much!